To Boldly Tank | Spaceship! Spaceship! Spaceship! 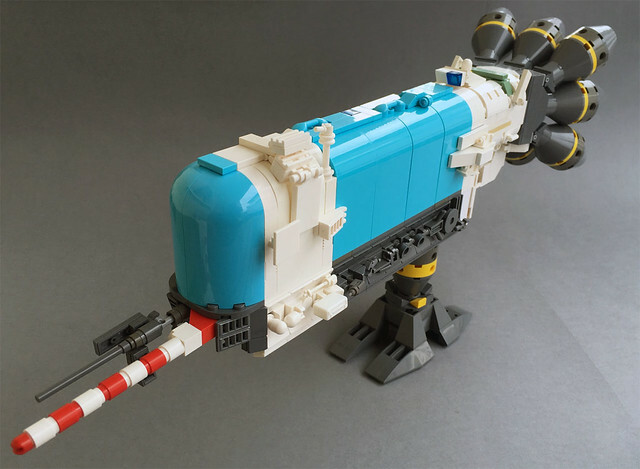 I don’t have any bulk liquids I need to haul through the icy vastness of space, but if I did this space tanker by Gamabomb would be ideal. I applaud the use of those big blue curve pieces and I love the contrast between the smooth surface of the tank and all the greebly bits around the edges. There’s lots of random little parts which all work together to look like they do… something. There’s even a minifig briefcase in there if you look closely. This entry was tagged microscale, MOC, NPU. Bookmark the permalink.